In addition to being an antiquarian book seller, Raptis Rare Books has a variety of products for music collectors as well. View our selection of signed records, rare vinyl LPs and eclectic soundtracks. 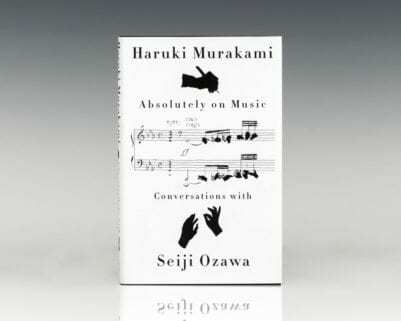 We also carry biographies on famous musicians and other vintage books on music. Browse through our entire collection online below, add a product to your wish list, ask any questions about a specific product or order online today! Laurents, Arthur & Stephen Sondheim. Anyone Can Whistle: A Musical Fable. First edition. Octavo, original cloth. Warmly Inscribed by both Arthur Laurents and Stephen Sondheim. Fine in a near fine bright jacket without the fading usually encountered with the spine. 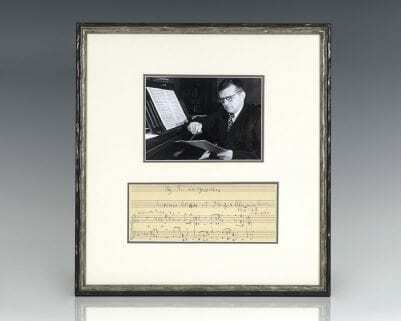 Autographed Letter Signed From Carl Haverlin To Igor Stravinsky. Single page typed signed letter with notes in Stravinsky’s hand. Typed signed letter from 1962 to Igor Styravinsky from Carl Haverlin, pioneer in radio broadcasting, and longtime president of Broadcast Music Inc. The letter is on Broadcast Music Inc. stationary, and Haverlin writes to inquire about some illustrations which Dulac had made for Stravinsky’s Firebird Ballet. He writes: “I…take the liberty of asking you if your memory will bring forth any background on the sketches.” In the margin adjacent to this sentence, Stravinsky writes “Not at all!” in red pen. Haverlin closes the letter with: “Photostats of the sketchbook pages are enclosed.” Beneath this Stravinsky writes, along with his signature, “I find it unfortunately very bad.” Matted and framed opposite a photograph of Stravinsky. The entire piece measures 26.5 inches by 19.25 inches. Cambridge, MA : Harvard University Press, 1971. New York: E.P. Dutton, 1943. First edition of folk singer and songwriter Woody Guthrie’s autobiography, and only book published during his lifetime, in the scarce first issue dust jacket. Octavo, original cloth, frontispiece portrait of Guthrie after a photograph by Robin Carson, illustrated with sketches by the author. Near fine in a very good dust jacket with chipping and wear, bookplate. Rare and desirable. Bourne Inc. 1919-1948: Songs of Yesterday That Are Memory Songs of Today. New York: Bourne Inc. and ABC Music Corporation, 1919-1948. First edition of this catalogue of songs published by Bourne Music Company between 1919 and 1948. Quarto, original green cloth, gilt titles to the spine and front panel, pictorial endpapers. Bonnie Bourne’s copy with her name gilt on the front panel. In near fine condition. Rare a desirable with noted provenance. Chansons De Salon Populaires et Legeres Operettes. Finely bound example of the popular songs and operettas of French chansonnier Gustave Nadaud. Octavo, bound in three quarters morocco over marbled boards, gilt titles and tooling to the spine, raised bands, marbled endpapers. In very good condition with light rubbing to the extremities. Dirty Work Signed Album. The Rolling Stones. Original LP of The Rolling Stones Album Dirty Work. Signed by Mick Jagger and Keith Richards on the front cover. Richards has written “Love Keith Richards.” In very good condition. Framed. 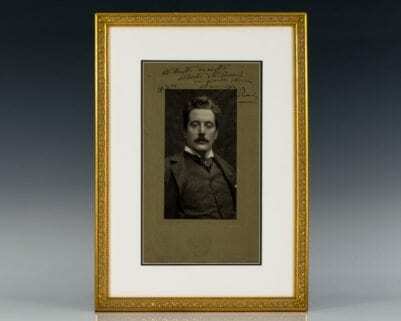 Photograph signed and inscribed and dated in 1905 by Italian composer Giacomo Puccini to Argentine composer, conductor, and pianist Alberto Williams. Double matted and framed. The entire piece measures 13 inches by 18 inches. An exceptional piece with noted provenance.